Everything you need to know about Adult Nursing...at a Glance! 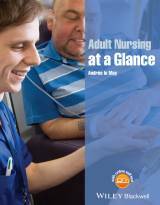 Adult Nursing at a Glance is the perfect companion for study and revision for Adult Nursing students from the publishers of the market-leading at a Glance series. This title blends up-to-date evidence and essential knowledge from expert experience of nursing practice, research and teaching, in an easy-to-follow guide for student and newly qualified nurses. Adult Nursing at a Glance covers the essential components of excellent nursing, highlighting the skills that all students need to develop from the outset of their studies, and encompassing organisational and leadership skills. With an emphasis on patient care and dignity, this title is the perfect guide to healthcare delivery, management and professional development. • Contains all the information you need to provide the best patient care, including care planning, symptom control, communication and health promotion. Andrée le May is Professor of Nursing within the School of Health Sciences, at the University of Southampton.